Here's my latest wall based on Okamiden. The characters are little Chibiterasu and his grandparent Shiranui. Shiranui was vectored from this picture and Chibiterasu was vectored from a small image on the game's instruction booklet. The wallpaper was made with Illustrator aside from the final texture and blur applied. Main version: No texture on Shiranui and Chibiterasu. Alternate #1: Texture on everything, blurred based on distance with focus on Chibi/Shiranui. Alternate #2: Texture on everything, no blur. Browse Okamiden Gallery: Recent | Popular. show my support here as well :3 Great work! oh wow this is worthy of my faving, and I don't do that often. 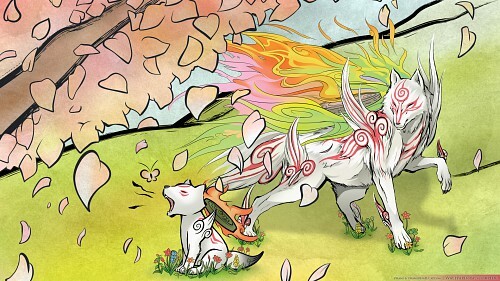 very nicely done, it's breathtakingly beautiful and I'm a big time okami/okamiden fan. Whoa, great! 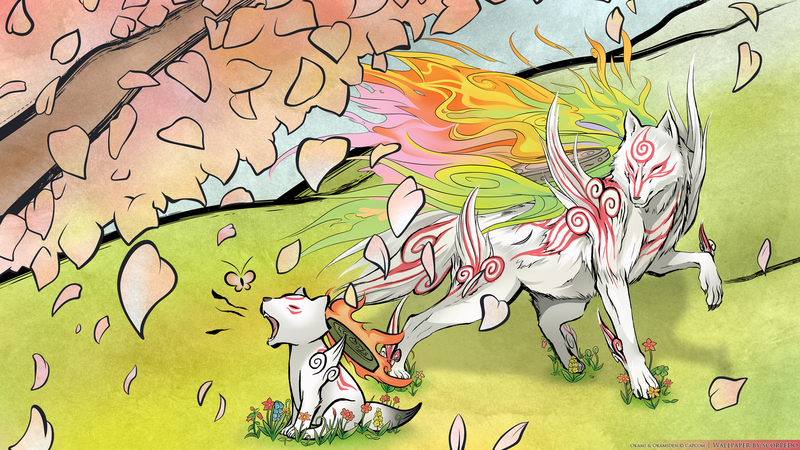 love the pastel colours^_^ you can see the effort that went into this and feel Okami spirit^_^ Chibiterasu is so adorable! wow love the vector of Shiranui and Chibiterasu. nice job. I LOVE YOU, I LOVE IT. It's the most beautiful wallpaper that i never seen !. BIG good WORK ! Wow , So beautiful ! i like it ! waaaa waaaaa! I love it >o<! tnks for this beautiful wall! The vector is amazing and Chibiterasu is super cute. Lovely work. It's really beautiful and the color are so nice & fresh!